Why Do Terrorist Organizations Use Women As Suicide Bombers? 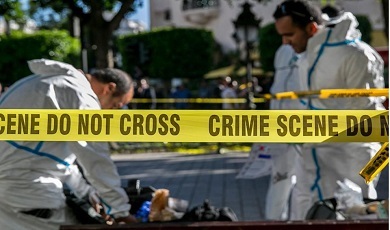 The news earlier this week that a woman in Tunis blew herself up in front of a shopping center came as a shock to many. This is the first attack in the Tunisian capital since 2015. While the attack has yet to be claimed, instability in bordering Libya remains a concern, as do claims by authorities that Islamic State and Al Qaeda continue to recruit extremists in Tunisia. What remains unique about this suicide bombing is that it was carried out by a woman. It is unusual for terrorist organisations such as the Taliban, Al Qaeda, or Islamic State to actively encourage women to take up arms. Instead, women are often used as a tool to recruit other women, reward fighters, and produce the next generation of ‘cubs’. The group views them as vital participants in its construction of a “proto state,” and women have been willing to participate. After all, more than 13% of the foreigners who became affiliated with Islamic State in Iraq and Syria are women. Other terrorist groups, such as the Tamil Tigers in Sri Lanka, Hamas, Boko Haram, Chechen organizations and some Al Qaeda affiliates, have also made extensive use of women. History shows that the allure of physically taking up arms is not limited to men. The core operatives of Germany’s Baader-Meinhoff gang in the 1970s were women. Groups that do use women in this way are adept at exploiting women who feel isolated, perhaps as a result of domestic turbulence, gender inequality, or the lack of representation in society. As an alternative, they are offered a strong narrative of ideology, with suggestions that by joining an organisation such as Islamic State, for example, they can reverse the ills of life outside the caliphate. Moreover, they are enticed by the idea that they will be part of a tight-knit collective sisterhood that will provide them with support and friendship. This new life, in turn, is eventually used as a means to justify their radicalization and sacrifice – the latter including the form of taking their own lives. Through social media and its own propaganda, groups such as Islamic State actively engaged with their female audiences, encouraging them to participate in a non-combatant capacity to consolidate the new caliphate. The idea of forging a new state, a new beginning, and mothering a warrior class had a deep, almost Spartan appeal. It is important to note that the use of women in such roles holds a tactical appeal and raises new security challenges for officials. Female terrorists can sometimes avoid detection more easily than men, and are less likely to be stopped and searched. Concealing weaponry or physical signs of trepidation before an attack— warning signs that security forces look for— can be achieved by wearing appropriate clothing. In response, we must do better at offering women a viable alternative to violence. We can begin by emphasizing democratic and human-rights based values, and empower women to play a more active role against extremism. But more than that, we must address the ideology espoused by many terrorist organisations head on and prove it to be false. Working with at-risk women through outreach, gender-equality initiatives, and empowering their voices will be a crucial step in this. When we talk of “full-spectrum” responses to terrorism and extremism, we must not neglect the role of women. Addressing a symposium on women on Friday, first lady Emine Erdoğan said violence against women was one of the biggest problems in Turkey and there was a need to fight against the mindset breeding this violence. "We have to take steps together against violence and the first step should be empowerment of women," Erdoğan said in her speech at the International Woman Symposium in the southeastern city of Mardin. "But more importantly, we have to fight against the mindset which lies beneath the violence. We have to change traditional perceptions breeding the violence. This is not only a women's issue but an issue for men as well," she said. The first lady added that one-third of women in the world were exposed to physical and sexual violence at least once in their lives, and that such violence cannot be justified. MUMBAI: The city crime branch has arrested three persons, including a hotelier from Dubai, for offering women jobs abroad and then pushing them into prostitution. The arrested persons-hotelier Faridul Haq Shah alias Tipu (55), and his two touts Kamal Anwar Shaikh (56) and Tinku Dinesh Raj (36)-have been booked under IPC sections of cheating, extortion, exploitation, and under Immoral Traffic Prevention Act. The police said that the trio has sent more than three dozen women to Dubai and Bahrain and sold them off. The racket came to light only after a woman who was sent to Bahrain on a three months' visa to work in the kitchen of a hotel was pushed into prostitution. "As she refused to get into prostitution, the gang refused to release her passport and demanded Rs 2 lakh from her. The woman then got in touch with her mother, who paid the money and rescued her," said an officer. After returning to India last week, the woman approached the police. "She got in touch with Kamal in June and he lured her with a vacancy in a hotel," said Ajay Sawant, senior inspector of anti-extortion cell. The woman has told the police about the involvement of another person named Salim, who is a hotelier in Bahrain. She has said that he used to send her to various customers. "Salim would give digital cards to each of these girls and a target. Their target was to earn 20,000 dirhams (nearly Rs 4 lakh) in three months. "We raided the houses of the accused and seized several passports, photos and fresh applications," said Dilip Sawant, DCP (crime). Many scholars, teachers and colleagues have written much about A.M. A. Azeez’s contribution to Muslim education, but very little is known about his thoughts in the sphere of Muslim Women’s education in Sri Lanka. Having benefitted greatly from his work in the field of Muslim Women’s education, it is only befitting to share a few thoughts regarding Azeez’s ideas on education and status of Muslim Women in Sri Lanka. Azeez realised at a very early stage that the lack of education was the main reason for the backwardness of the Muslims. He urged young men to follow higher education; also with a few like-minded friends, founded a Scholarship Fund to help needy students. His concern for education led him to retire prematurely from the Ceylon Civil Service in 1948 and take up the post of Principal at Zahira College Colombo. What of the education of Muslim Women? The Holy Quran stresses the importance of the pursuing knowledge and education. During the latter part of the 19th Century, therefore, some interest was taken in educating Muslim girls by those personages like Siddi Lebbe, who wanted to improve educational standards among the Muslims including Muslim girls. In 1891, Lebbe established the first school for Muslim girls in Kandy, followed by another in Gampola and then in Kurunegala. These schools, however were failures resulting from parental indifference. Sir Razik Fareed urged the Government to establish schools only for girls so that Muslim parents would send their daughters, but only a small percentage made use of these schools. Even up to the 1940s there was opposition to educating Muslim girls. In 1946 Muslim Ladies‘College was established at a new premises in Colombo, with the encouragement of Sir Razik Fareed. Ayesha Rauf was appointed as Principal. Azeez welcomed the establishment of the school and he hoped that this Muslim girls’ school would follow the same systems that he introduced at Zahira College. To him this was a great step forward in promoting education for Muslim women. As stated by the Poet/Philosopher Allama Muhammed Iqbal, Azeez believed that “Education being a preparation for life is needed by all, the rich as well as the poor, the male as well as the female.” He was a fervent supporter of women’s rights to higher education and to gain a University degree- a notion that was the result of his educational background. Azeez was from an educated family of Moor street Jaffna. Most of the families, in Jaffna, including the women were literate. They were not English-educated, but were well-versed in Arabic, Tamil and Arabic-Tamil (Tamil written in the Arabic script enriched by many Arabic words). Young girls attended the Madrasas with young boys; later they enrolled in schools near-by but did not continue schooling after puberty. Although Moor Street was demarcated as a Muslim area there was much interaction and friendship with the Tamil community; in fact Azeez attended Vaidyeswara Vidyalayam and later Jaffna Hindu College. Perhaps this was why Azeez became a very liberal-minded person and was keen on friendship and understanding among all communities. Azeez has often said that it was his mother who instilled the faith in Allah and the importance of education not only for males, but for females too. Guided by his mother, the children of the family learned to recite the Holy Quran and the meaning in their spoken language, Tamil. They read Islamic works in Arabic-Tamil and in Tamil. It was at this time that Azeez began to be interested in education for girls; he encouraged his cousin Sithy Khadija to sit the London Matriculation, for which she attended Holy Family Convent, Jaffna. She passed this exam, but in keeping with the times did not continue further. Azeez was adamant about the right of women to higher education and of their right to gain a University degree. He disapproved of the prevalent Purdah system (seclusion) and the un-Islamic dowry system. The Purdah system hampered the education of women. They did not attend school after puberty. They were secluded and taught to recite the Holy Quran and to read the Hadiths within the confines of their homes; at most they also learned Islamic songs. In addition, girls were taught cooking and sewing to prepare them for an early marriage. The Purdah system was prevalent even up to the 1950ties and was practiced rigidly. It was at such a time, that Azeez encouraged the education of Muslim girls and discouraged the dowry system. He stated that education would end, at least discourage the dowry system and it certainly did. He also expressed the belief that an educated mother would bring up disciplined and educated children who would want to better themselves - a necessity for the progress of the community. He expressed these views in his speeches, writings and at seminars and discussions. To a great extent his efforts were successful and many young women were allowed to follow teacher-training courses. From the 1950 ties onwards, the contribution of Azeez and like-minded Muslims such as Siddi Lebbe, Dr Kaleel and Sir Razik Fareed spearheaded the education Muslim women who had taken up the challenge to pursue higher education and were aspired to gain University degrees and professional qualifications. Their efforts have made women independent. They are able to contribute to the family income resulting in an improved standard of living. They can also encourage their offspring to pursue education and help themselves and the community prosper. These educated Muslim women are able to stand successfully alongside educated women of other communities with confidence. They have taken to many professions and hold responsible positions in Business. They have motivated other Muslim women to pursue higher education and gain employment. This augurs well for the Sri Lankan Muslim community. Police in New York investigating the deaths of two Saudi sisters found dead along the banks of the Hudson River say they have been told the women said they would rather die than return to Saudi Arabia. Dermot Shea, the city’s chief of detectives, said investigators had so far found no evidence of foul play in the deaths of Rotana Farea, 22, and Tala Farea, 16. "At this point in time we have no credible information that a crime took place in New York City… but it is still under investigation," he told a press conference on Friday. The women were found on October 24 with their waists and ankles loosely bound to each other with duct tape, posing a mystery to detectives. “We also have sources that the detectives have developed from the investigation so far, that they would rather inflict harm on themselves – commit suicide – than return to Saudi Arabia,” said Mr Shea, adding that he believed they had asked for asylum in the US. He offered a timeline of their last months, saying the sisters were last seen by their family in Virginia on November 30 last year. They had been living in a “shelter-like” facility in Virginia and detectives were aware of allegations of abuse within the family, although they had not been corroborated. Travel records showed they arrived in New York around September 1. “We have them staying at a number of high-end hotels in New York City during this time,” said Mr Shea, saying they had been spotted on CCTV footage in apparently good health. However, that changed when they began to run out of money, he added, saying their credit card was “maxed out”. An early morning exerciser – who came forward because of a "story that is haunting him" - spotted them 10 metres apart in a park close to the Hudson River at about 7am. “They were sitting with their hands in their heads, their heads lowered, making noises that he described as praying,” said Mr Shea. Police initially believed they could not have jumped into the water as their bodies showed none of the injuries expected from leaping from a bridge. Detectives now believe they may have waded into the water. “It is entirely credible that the girls entered the water alive,” said Mr Shea, adding that the tape was not so much “binding” the women together as “more like keeping them together”. He added that he was still waiting for the medical examiner’s report on the cause of death and appealed for anyone who had met the sisters since August to come forward with further information. AHEAD OF the Winter Session, when the Centre’s ordinance making instant triple talaq a criminal offence is likely to be tabled in Parliament, the BJP has appointed two “teen talaq pramukhs” in Uttar Pradesh to reach out to triple talaq victims and seek their suggestions for better rehabilitation. While Dr Nazia Alam and Shahnaz Khan, both state secretaries of the party’s minority wing, have been appointed as “teen talaq pramukhs”, there are plans to appoint a Muslim woman to the post in all the six regional units and 93 district units in the state. This decision was taken at the BJP minority wing’s state executive meeting held recently. These pramukhs will also distribute Hindi translations of the Quran to Muslim families. “If they read Quran in a language that they are comfortable in, the practice of triple talaq can be checked, because it is clearly prohibited in the Quran. Through our campaign, we will also have to break the barrier that hardliner clerics have created by conveying the wrong message,” Nazia told The Indian Express. She said the campaign would begin after Diwali, and the first task would be to identify the victims. “Currently, there is no official figure on the number of triple talaq victims. We have to identify them and approach them. Being a woman, we can do this easily… We will also hold press conferences to narrate their ordeal, if they agree to it,” she said. She said the objective of the programme was social, not political. In the first phase, the focus will be on Muslim-dominated districts including Rampur, Bareilly, Saharanpur, Aligarh and Muzaffarnagar. Hyder Abbas Chaand, state president of the BJP’s minority wing, said triple talaq victims who have shown courage by raising their voices in public as well as women who have fought for their cause, will be honoured by the party. In its manifesto for the state assembly polls in 2017, the BJP had promised to take up the issue of triple talaq. After their poll victory, BJP leaders had claimed that Muslim women had backed them as the party was opposed to the practice. The party had also raised the issue during the urban local body polls in the state last year. Guwahati: Despite #MeToo movement and other government initiatives to make society safer for females, another shameful incident took place. A minor girl was molested for sitting with a Muslim boyfriend at a secluded spot. According to the report published in India.com, this incident took place in Assam. This incident was filmed by the boys who molested her. In the video, she was seen requesting the boys to let her go. It is also reported that the boys saw the couple sharing an intimate moment. When the boys rushed to the spot and started assaulting the couple, the girl’s boyfriend managed to escape. The boys then misbehaved with the girl. It may be mentioned that earlier, in a similar incident, a minor girl was molested by eight unidentified youths in Jehanabad, Bihar. BUENOS AIRES: Ploughing a lonely furrow, the sole female presiding over an International Federation at the summer Olympic Games believes she will not be isolated for much longer. Marisol Casado, the Spanish head of the International Triathlon Union, predicts an “explosion” of women from the Middle East taking up positions of sporting power in the very near future. A member of the International Olympic Committee (IOC) since 2010, Casado expressed confidence however that she will soon have company at boardroom level, adding her recent visits to the Arab World have left her with the impression the region is on the verge of major change when it comes to gender empowerment. Appearing in a panel discussion entitled “Women in Sport,” Casado was due to speak alongside Saudi Arabia’s Princess Reema bint Bandar Al-Saud, vice president of the General Sports Authority. A conflicted schedule, however, forced the princess to withdraw, leaving Syrian swimmer Yusra Mardini the only female Arab speaking at the two-day meet. Such underrepresentation is apparent at the recent World Youth Olympics too, where more than 4,000 athletes took part, but only 98 were Arab girls. Kuwait, Libya and Qatar did not bring a single female athlete to the two-week Games, despite the IOC promising an equal number of male and female participants across the 32 sports. Yet another Arab women did take to the stage after Casado’s prediction. Two-time Jordanian Olympic swimmer, Samar Nassar, was awarded the IOC’s Women and Sport Award for Asia in recognition of her work helping promote gender equality through football in the Middle East. She is the first winner from the Middle East since Bahrain’s Sheikha Hayat Bint Abdulaziz Al-Khalifa won in 2015. Nassar, a board member of the Jordan Olympic Committee since 2014, was the Kingdom’s driving force behind the successful hosting of the FIFA U17 Women’s World Cup in 2016. She also pioneered various societal programs, including establishing football programs for female Syrian refugees at the Zaatari camp in Jordan. “I’m very happy to receive this award,” she told Arab News. “It was for our efforts in promoting women’s football and sports in the region and to use the U17 World Cup as a catalyst to promote social change in an area that is desperate for it. We see the momentum now as there are more women than ever participating in sports. And it is still growing. Among those who watched Nassar accept her award was Jordan’s Prince Faisal bin Hussein, whom Nassar called a “champion of promoting and advocating for women’s sport”, and Raha Moharrak, the youngest Arab and first Saudi Arabian to conquer Mount Everest. Phumzile Mlambo-Ngcuka, the United Nation’s Under-Secretary and executive director of UN Women, said that while she agrees growth is a slow process, more must be done by those in power. Especially in terms of having more Arab women represented at major events. “That has to be fixed,” she said. “We need society to shout very loud about this and call it out for the injustice that it is. You cannot tell me there are not as many women capable of sport in the Middle East. Women there are just as capable as women in Kenya or any other country where women athletes are playing a significant role. Brian Lewis, a member of the IOC’s Gender Equality Review Project, took it a step further, calling for Olympics president Thomas Bach to eventually be replaced by a female. Saudi Arabia’s automotive sector is set for a rapid transformation in the coming years, with 20 percent of the female population, or three million drivers, expected to be added to the kingdom’s roads by 2020, according to a new report. A whitepaper, published by global research company Aranca, said the lifting of the ban on women driving in Saudi Arabia, along with recovering oil prices and economic policies aimed at boosting consumer spending, will result in an eight percent per annum increase of passenger vehicles sales until 2022. The report added that in addition to new car sales, the positive impact of a new customer segment over the next 1-3 years will be felt in the kingdom’s automotive aftermarket, which was valued at $7.4 billion in 2017. According to Aranca, vehicles in operation in Saudi Arabia stood at 7.3 million in 2017, with 438,000 new passenger cars and 110,000 new commercial vehicles sold for the year. Tyres accounted for the greatest slice of revenue in the Saudi’s spare parts market, with a 30 percent share in 2017 ($2.2 billion). Aranca’s whitepaper was published ahead of Automechanika Jeddah 2019, the only dedicated trade show for the automotive aftermarket and service industry in the kingdom’s western region. The 3rd edition of the three-day event will take place from February 26-28 at the Jeddah Centre for Forums and Events. Aranca said 10 million vehicles will ply Saudi roads by 2022, including 6.5 million passenger vehicles and 3.5 million commercial vehicles. It added that as a result, demand for spare parts and related auto services will grow six percent annually, reaching a value of $9.8 billion in 2022. Many of these opportunities will likely arise in Saudi’s western regions of Madinah and Makkah, where more than one million women are expected to get behind the wheel by 2020, it noted. The whitepaper further stated that key industry players are already taking initiatives to capitalise on opportunities created by women being allowed to drive, including the creation of women-only car showrooms, auto-insurance claims centres and driving schools dedicated to women. Thirty-year-old Shamsia Hassani is widely recognized as Afghanistan’s first, if not only, female graffiti artist. Being a graffiti artist anywhere in the world presents difficulties. In war-affected Kabul, such artists face special problems. Hassani, however, was recently able to share her work with a broader audience. She was invited to show her work at a street art celebration in the Turkish city of Istanbul. She spent three days creating a large painting on a city wall. It shows a usual subject of Hassani’s work: a young woman dressed in cool clothes, playing an instrument. The woman’s eyes are closed and she does not have a mouth. Hassani says those qualities represent the difficulties faced by women in Afghanistan. The chance to attend the Istanbul event is welcomed, Hassani says, given the increasingly difficult environment in Afghanistan. So, she says, she continues with her street art to help empower people in her country. Hassani was born in Iran to Afghan parents who had fled the war at home. She says could not study art in Iran because she was Afghan. Her parents moved back to Kabul so Hassani could study art at Kabul University, where she now teaches. “My family is very supportive, my parents and my husband, they always support me in my works. All the time I am careful,” she says with a nervous laugh. Shamsia Hassani says that in Kabul she generally has only a few hours to complete her work because of the dangers. In Istanbul she had three days to complete her painting, a rare treat. It is not only the risk of bombs and hostility toward women artists, that Hassani faces. Artistic differences with the owners of the walls upon which she paints also can be a problem. “I am trying to get permission, but sometimes it’s difficult. Usually the owner of the wall never gives me permission to paint something — fantasy like this,” Hassani said, pointing to her painting. When asked what keeps her going, Hassani says it is her love of art and the power it has for good. She says she brings art to people in Afghanistan because there are no art museums. Public outcry has grown over allegations that Sıla Gençoğlu, a famous pop singer, was beaten by her actor boyfriend Ahmet Kural, known for his comedy films and TV series. Gençoğlu, who uses the stage name Sıla, filed a complaint on Thursday claiming that Kural assaulted her on Oct. 29. The couple, who made the headlines with their romance last year, had broken up in January but reunited last month. Kural denied the allegations and claimed that there was only a brief scuffle. However, the account Sıla gave in her complaint and photos showing bruises on her body contradicts Kural's claims. The criminal complaint, which led to a three-month restraining order on Kural, says that the actor hit Sıla's head against a wall, hit her with an ashtray and dragged her on the ground. Sıla also claimed that Kural verbally abused her during the assault at the actor's Istanbul home. He also threatened to kill her. Social media in Turkey, where violence against women remains a hot issue, was awash with comments condemning Kural. Yapı Kredi Bank whose commercials starred Kural, announced on Friday that they had "ceased cooperation" with Kural after the news surfaced, citing that his alleged behavior contradicts the ethics of the bank "which advocates gender equality and the empowerment of women." In a written statement, the non-profit Women and Democracy Association (KADEM) said it was concerning that celebrities would resort to violence that "tramples on the honor of humanity." "Violence is violation of human rights and does not differ between genders. Everyone is entitled to the right of life without threat of violence," the statement added.After the complaint, the Istanbul Prosecutor's office summoned the actor to testify. Speaking to reporters Friday as witnesses to the incident testified, Sıla's lawyer Rezan Epözdemir said that the complaint was "a cry for all women exposed to violence." "She is a victim of 45 minutes of physical and psychological violence. Raghda Hassan is teaching me how to make yalanji. With a dozen other people, I’ve signed up for a cooking class with Tayybeh, a food company run by Syrian refugee women. Since it launched with a pop-up dinner two years ago, Tayybeh – the word can be translated from Arabic as both “delicious” and “kind” – has branched out into catering and, over the summer, a food truck. This is the company’s first cooking class. We’ve gathered at a community centre kitchen for instruction from Ms. Hassan, 41, and her 21-year-old daughter, Mariam. Ms. Hassan is one of seven cooks now working with Tayybeh. Her English is halting, but a Tayybeh co-ordinator is on hand to translate. Besides, Ms. Hassan teaches by example. There are no measuring cups, no written recipes. We crowd around a small island and roll up our sleeves. Yalanji are stuffed grape leaves, akin to Greek dolmathes. To make them, you roll the brined leaves from the top-down, then tuck the edges around the rice filling to form a tidy bundle. My first attempts are sloppy. “Like this,” Ms. Hassan says as she shows me. My next attempt is perfect. We make malfoof, a cabbage salad laced with sumac; sfeeha, open-faced meat pies; and fatayer, puffy dough triangles stuffed with cheese the women prepare themselves. Tayybeh, with its Instagram feed and strangers eating together for a common cause, is a modern riff on a centuries-old pattern of immigrants and refugees cooking their way into a country’s culture. Similar ventures have emerged elsewhere; in Toronto, the Newcomer Kitchen sells meals cooked weekly by Syrian refugee women. One of Tayybeh’s recent catering jobs was a reception for a screening of Soufra, a film about a catering company founded by women in a refugee camp in Lebanon. The common ingredients are women, food and hope. Ms. Hassan and her family used to live near the port city of Latakia. They fled after bombing attacks intensified and relatives were injured or disappeared. The family – Ms. Hassan, her husband and their four children – spent four years in Turkey before they arrived in Canada as government-sponsored refugees in late 2016. She arrived the night of Tayybeh’s first dinner, a coincidence she now sees as a sign of hope. She joined the group soon after. The family lives in Surrey, B.C. Her husband, a former contractor, works in a hot-tub factory, and their children go to school. The family was part of an unprecedented influx. Before taking office in 2015, the Liberals promised to bring 25,000 Syrian refugees to Canada by the end of the year – a target that wasn’t met until February, 2016. But since November, 2015, Canada has admitted more than 58,000 Syrian refugees, who have settled in cities and towns across the country. Our class takes place a few days before Canadian Thanksgiving. Does Syria have anything like Thanksgiving, someone asks? There’s a discussion about Eid al-Fitr, the festival that marks the end of Ramadan. Ms. Hassan shows us how to make rosettes from lemon peels. Nihal Elwan, an international-development consultant and the spark plug behind Tayybeh, met Ms. Hassan and the other women while volunteering as a translator. She remembers them being haunted by grief and worry. The women did not speak English. But they all knew how to cook. Ms. Elwan arranged the first pop-up dinner in a friend’s restaurant. It sold out. Tayybeh grew, using social media to advertise. The women learned to take transit. Their husbands learned to help with clean-up. Tayybeh gained a following. Christina Braybrooke, a cooking-class participant, has been to several dinners and hired the company to cater a family reunion this summer. Another couple, Terry and Cheryl Murphy, are there because, so far, they haven’t been quick enough to buy tickets to a Tayybeh dinner. The cooking class seemed like a good alternative. I ask them if they have strong feelings about refugees. Through Ms. Elwan, I later ask Ms. Hassan what she values most about Tayybeh. “Tayybeh is my first work experience and it is a very successful step in my life,” Ms. Hassan responds. “It was the reason for me to get out of the house and learn everything about this city. Tayybeh also allowed me to contribute to my family’s income, and that makes me very happy and proud. The most significant and symbolic connection is I landed in Vancouver on the day of Tayybeh’s first pop-up dinner event. I feel that we’ve grown here together. Everyone leaves a mark in this life, and I hope to leave mine through Tayybeh." After a couple of hours, we sit down to eat. The lighting is fluorescent, the chairs are plastic, and we opt for paper plates. Ms. Hassan has brought a tablecloth. Everybody gets leftovers and baklava for dessert. False flag, Zionists r Worst Conspirators but poor fools.